Emerging from the grainy static of time, in a photograph taken 78 years ago today, two British gentlemen sit, as the saying goes, out in the midday sun. 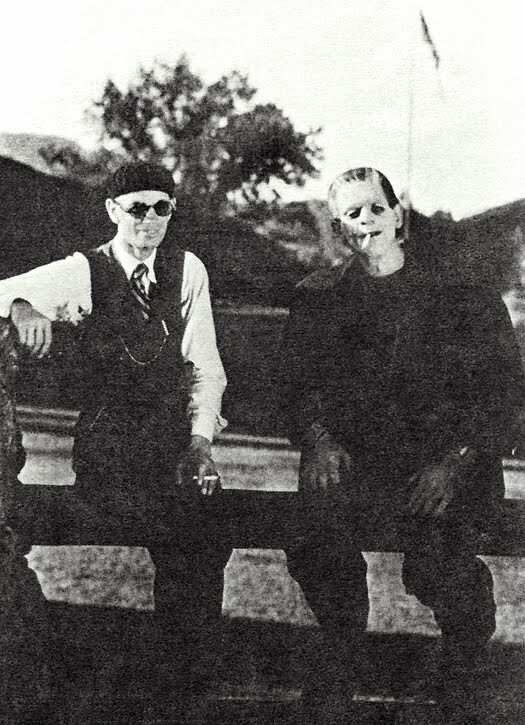 Perhaps a soothing breeze wafted off Malibou Lake, affording Mr. Whale and Mr. Pratt (aka Karloff) a bit of respite on their cigarette break in the notoriously hot summer of 1931. Whale, Karloff and young Marilyn Harris traveled to Malibou Lake on September 28 and 29 to shoot the difficult scene where the confused Monster accidentally drowns little Maria. I previously posted a history of Malibou Lake here. I have just now updated that post as information surfaces that Frankenstein cinematographer Arthur Edeson had built himself a house at the lake in 1926, making him the most likely candidate for suggesting the location and perhaps even guiding the crew with their cars and equipment trucks along the winding dirt roads to the site. Be sure to return here tomorrow, Tuesday September 29, for a terrific Frankensteinia Exclusive Guest Post as screenwriter John Cox drives out to Malibou Lake, looking for the exact spot where the notorious scene was shot. It’s great detective reportage and a fascinating journey you won’t want to miss, as John takes us along on a RETURN TO MALIBOU LAKE. I don't remember ever having seen that really GREAT shot before. Thanks so much for sharing it, Pierre. never seen this before..good one! Love it. Looking forward to tomorrows post!